Issue: Agricultural cropping systems can be either net carbon sinks or sources, while cropland fertilization can lead to enhanced nitrous oxide (N2O) emissions. Exchanges of the greenhouse gases carbon dioxide (CO2) and N2O over croplands can have large implications for climate change and agronomy practices. Action taken: We deployed a network of five flux towers to yield 16 site years of continuously measured CO2 and water fluxes, and we operated a hybrid chamber/flux tower system to measure N2O emissions at two sites. The results were analyzed in terms of annual net carbon and water exchanges and N2O emissions to establish a baseline for greenhouse gas budgets over wheat-cropping systems in the inland Northwest. Results: Winter wheat crops exhibited an annual net carbon uptake, while spring crops were carbon neutral or exhibited a slight carbon loss. No-tillage sites resulted in lower carbon and water losses compared to conventional-tillage fields. Annual estimates of N2O emissions (2 to 4 kilograms of nitrogen per hectare) exceeded the Intergovernmental Panel on Climate Change (IPCC) estimates for the region, which emphasizes the need for continued measurements to confirm this. Our results will help policy makers and growers understand how management practices affect the potential climate impacts of greenhouse gas uptake and loss from wheat-cropping systems in the inland Northwest. Waldo, Sarah, Jinshu Chi; Shelley N Pressley; Patrick O'Keeffe; William L Pan; Erin Brooks; David R Huggins; Claudio O Stockle; and Brian K Lamb, 2016. 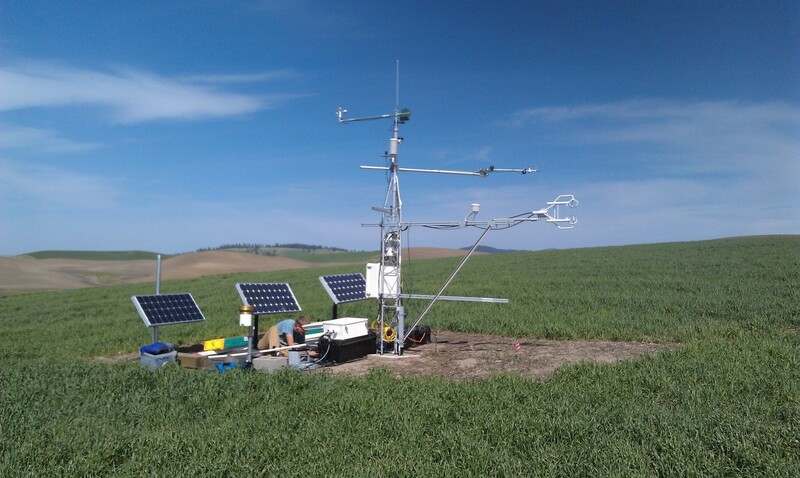 Assessing carbon and water dynamics at two agricultural sites in the inland Pacific Northwest using the eddy covariance method Part I: High- and low-rainfall cropping systems, Agricultural and Forest Meteorology 218–219, 25–36, doi.org/10.1016/j.agrformet.2015.11.018. Chi, Jinshu, Sarah Waldo; Shelley N Pressley; Patrick O'Keeffe; William L Pan; Erin Brooks; David R Huggins; Claudio O Stockle; and Brian K Lamb, 2016. Assessing carbon and water dynamics at two agricultural sites in the inland Pacific Northwest using the eddy covariance method Part II: Comparisons between no-till and conventional tillage cropping systems, Agricultural and Forest Meteorology 218–219 (2016) 37–49. Right: Nitrogen loss from agricultural fields during high winds were assessed using profile samples that grapped windblown dust, right of center in the photo. Left: Carbon export through surface runoff was monitored using parshall flumes and event-based water sampling. The image above was taken at the conventional tillage site. Issue: There is a risk that future climate change will deplete organic carbon and organic nitrogen in the soil and therefore reduce overall soil fertility and crop productivity. In addition to atmospheric exchange with the crops, soil carbon and nitrogen are transported by wind and water, which degrades water and air quality. Maintaining soil organic carbon levels and minimizing the negative environmental effects of carbon transport require an understanding of how management can reduce carbon loss. However, few data sets are available that document carbon and nitrogen transport by wind and water in the Palouse region. Action taken: Soil carbon and nitrogen transport by wind and water were measured at specific field sites across the region. In the western, arid region, where soil erosion is driven primarily by wind erosion, windblown dust samples were collected from multiple storm events and used to determine nitrogen loss rates. In the wetter, eastern region, soil carbon and nitrogen transport by water were measured from the micro-drainage scale to regional watershed scales. The effect of tillage management strategy on organic carbon transport was assessed at the field scale using both event-based water sampling and process-based computer modeling. The relative loss of dissolved organic carbon through subsurface tile drainage versus through surface runoff was also assessed at a long-term no-tillage site. Results: Sediment and nitrogen loss associated with windblown dust for 13 high-wind events and eight site years showed that nitrogen loss from windblown dust ranged from 0.1 to 1.9 kilograms per hectare (kg/ha) across the 13 events, with annual losses that could exceed 5 kg/ha. The data indicate that the windblown dust was not enriched in nitrogen as compared with parent soil materials, which suggests that more-simplistic modeling efforts that ignore sorting processes to determine total nitrogen transport by wind are appropriate. The water erosion data indicate that no-tillage practices greatly reduce soil organic carbon transport from 37 kilograms per hect- 7 REACCH Project Impacts Carbon export through surface runoff was monitored using parshall flumes and event-based water sampling. The image above was taken at the conventional tillage site. are per year (kg/ha/yr) in conventional tillage to 6.6 kg/ha/yr in no-tillage. Interestingly, the majority of carbon loss from the notillage field (5.6 kg/ha/yr) was transported as dissolved organic carbon in the subsurface artificial tile drainage flow; we observed very little soil erosion. We observed a general decrease in total carbon export with increasing scale, ranging from 19 kg/ha/yr at the edge of the field to 13 kg/ha/yr from the Palouse River at Hooper, WA, suggesting that much of the carbon that erodes at the field scale deposits within the stream system. The overall magnitude of soil carbon loss by wind and water at rates measured here is small relative to the overall soil carbon pool, estimated at 260,000 kg/ha in the top 1.5 meters of soil. However, process-based modeling indicates that without changes in tillage-management practices, soil carbon transport by erosion will likely increase by an order of magnitude by mid-century, which would negatively affect yields, especially for fields under conventional-tillage practices. Understanding the trends and effects of management on carbon export is an essential first step in the development of carbon budgets and full-scale cropping models capable of evaluating precision-based carbon-loss mitigation strategies. Sharratt, B., Graves, L., and Pressley, S. 2015. Nitrogen loss from windblown agricultural soils in the Columbia Plateau. Aeolian Research 18:47-54. Bellmore, R. A., J. A. Harrison, J. A. Needoba, E. Brooks, and C. Kent Keller 2015. Hydrologic control of dissolved organic matter concentration and quality in a semiarid artificially drained agricultural catchment, Water Resources Research 51:8146-8164. Issue: Greenhouse gas emission-reduction programs (e.g., cap and trade) offer the possibility that voluntary farmer actions to reduce nitrous oxide (N2O) emissions may be eligible for incen-tive payments through carbon-equivalent offsets. REACCH stakeholders have indicated significant interest in this strategy. Methodologies for quantifying emissions reductions of agricultural N2O from nitrogen management have been developed, but the available protocols have not been evaluated for the inland Pacific Northwest (PNW). Action taken: We reviewed five N2O-reduction protocols and performed a road test to quantify N2O-emission offsets generated under inland PNW dryland wheat-based cropping systems. Results: We concluded that the financial incentive from carbon offset credit alone is not likely to encourage any nitrogen management changes. Stacking of offset credit revenue, along with other incentive-based approaches, are likely required to realize policy-driven N2O reductions in the region. Brown, T., C. Lee, C. Kruger, and D. Huggins. Comparison of greenhouse gas offset quantification protocols for agricultural nitrogen management under Pacific Northwest dryland wheat. Frontiers in Ecology and Evolution. In review. Automated static chambers monitor subsequent greenhouse gas emissions on micro-plots. Photo by Dave Huggins. Issue: Long-term agricultural management under conventional tillage or no-till may create different risks or vulnerabilities for the production of nitrous oxide (N2O), a greenhouse gas, following rain events and/or nitrogen fertilizer applications. Action taken: We assessed the short-term (hourly) production of N2O following rain events and nitrogen fertilizer application in long-term management systems including conventional and no-till. Results: We found that no-till systems produced less N2O following both rainfall events and nitrogen fertilization than conventionally tilled systems and consequently are less vulnerable to these events. Kostyanovsky, K. I., D. R. Huggins, C. O. Stöckle, J. G. Morrow, and W. L. Pan. N2O and CO2 production in wheat-based cropping systems – Effects of no-till. Frontiers in Ecology and Evolution. In review.